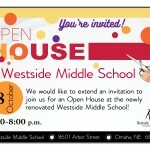 All families, students, staff and community members are invited to tour the newly remodeled Westside Middle School at an Open House event on Monday, October 8th. The building will be open from 6:00pm-8:00pm, with project leaders and administrators on hand to answer questions. Westside Middle School has had extensive renovations as part of the Facilities Master Plan, approved by Westside voters through a bond issue in 2015. Among the new features are enhanced security and entrances, a state of the art media center, improved circulation and classroom sizes, and more. Students and staff have remained in the building throughout this process, which has spanned several years. For more information, CLICK HERE to visit the Westside Community Schools facilities website.